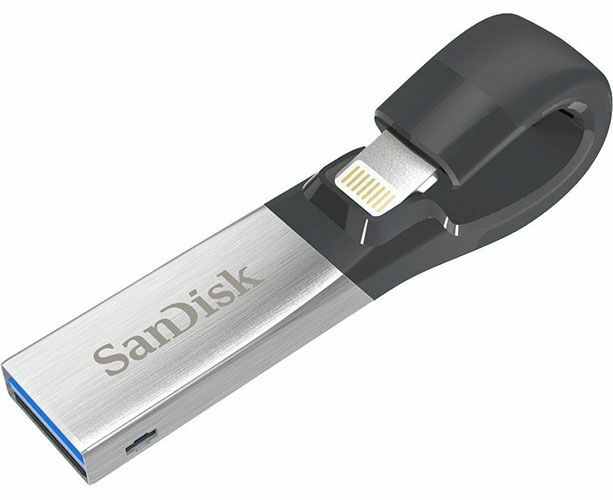 Did you know you can buy USB drives with Lightning connectors, designed specifically for the iPhone and iPad? Strange though it may sound, these devices are nothing new and have been on the market for a few years. But you’d be forgiven for not realizing, since they’re niche and come with plenty of caveats that limit their potential usefulness. Much of this is down to the restrictions imposed by Apple in iOS, but there are a few scenarios where Lightning USB drives could prove useful. So let’s take a look at the weird world of external smartphone storage. What Are “Made for iPhone” USB Drives? It’s possible to connect digital cameras to your iPhone using the Lightning-to-USB camera connection kit that Apple sells. This small breakaway adapter lets you connect other USB devices, including USB microphones and MIDI keyboards. 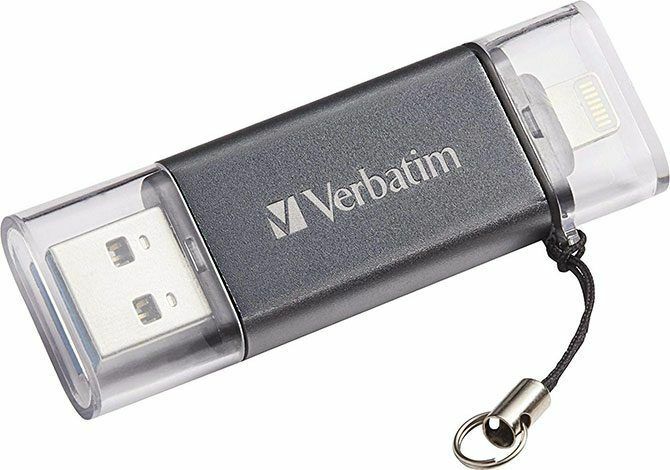 If you try to connect a regular USB drive using this adapter, you’ll likely see a message that “this device is unsupported” or that it draws too much power for the iPhone to host. This is where USB drives designed specifically for iOS attempt to bridge the gap. Apple produces instructions for manufacturers to follow when designing accessories for the iOS ecosystem. These products are certified as “Made for iPhone” (MFi) which means they’re designed to work flawlessly with iOS. This applies to wireless speakers, Lightning charging cables, and external storage devices. USB drives with the “Made for iPhone” certification are double-ended pen drives with both Apple’s proprietary connector and a generic USB connector. Most of these use the old USB type-A connector, but we’ll likely see a lot more USB-C accessories going forward. These drives are designed with low power usage in mind. This allows your iPhone to power and mount the drives, without draining too much battery. Look hard enough and you’ll find them in office supply stores, electronics retailers, and (in my case here in Australia) your local post office. There are two main styles of drive: a curved “clasp” design and a regular “stick” pen drive. The curved design clips to the bottom of your device and curves around the back, which makes it easier to keep the drive connected for extended periods. Regardless of design, you probably won’t want to walk around for too long with these connected to your device. What Can You Use a Lightning USB Drive For? If you’re wondering what the point of this is, then it’s likely these devices are not for your needs. You’re not alone in that assessment, since much of the potential behind these devices is dampened by the restrictive nature of iOS security. They add additional storage to your iOS device: This could work for watching movies or TV shows that won’t fit on internal storage. They’re potentially useful for backing up your Camera Roll: The usefulness here will depend on the size of your photo library and the speed of the transfer. They’re perfect for dumping large videos: If you have limited internal storage and you use your iPhone to shoot videos (especially long videos or 4K content) then these devices are perfect intermediary storage that free up space on your device so you can keep shooting. They can be useful for transferring data between an iOS device and computer: Particularly if AirDrop is not available (for Windows users), though there are limitations here too. But of course, there are some caveats to these usage examples, and your mileage will vary. There are some obvious and not-so-obvious problems with these drives. The first is that you cannot charge your device while they’re connected, since these devices usually provide no power of their own. That means especially large file transfers, like backing up your entire Camera Roll, might not complete before your battery depletes. These drives are all heavily reliant on their own manufacturer-specific apps, which you’ll see an invite to download when you plug them in. 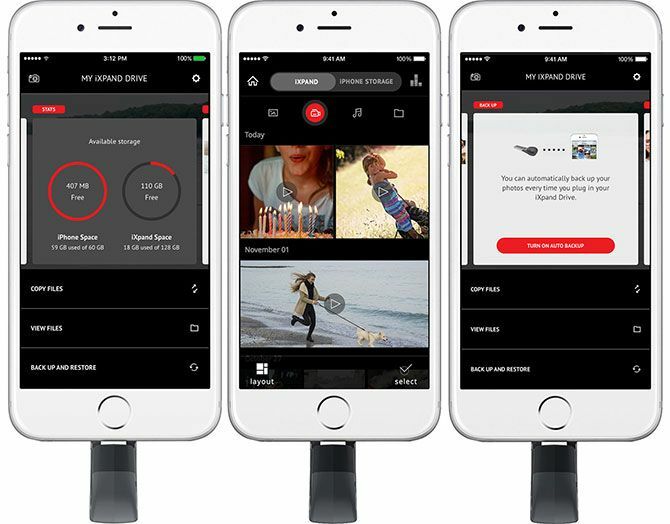 These apps handle everything, from media playback to file transfers (yes, even backing up your photos and videos). If the developer stops updating the app, you might experience compatibility issues with your drive and future versions of iOS. Media playback within these apps is entirely dependent on what codecs the app supports. Fortunately, there are some apps that work with manufacturer APIs that can play media directly from the drives. Infuse Pro ($15) supports playback of media from SanDisk iXpand and the Mophie Space Pack, but it’s quite a pricey option compared to free iOS media players. Drive manufacturers list many of the compatible third-party apps on their websites, so it’s best to check what your chosen drive can do before you buy. The manufacturer’s app may severely limit the usefulness of your drive. While SanDisk’s iXpand app allows you to send files to other apps using the iOS Share extensions, others do not. Similarly, with it you can export a file and choose iXpand as the location to copy it to your USB drive. Not all apps are this useful, especially from cheap and generic manufacturers. One final note on media playback: DRM won’t work. That includes iTunes-purchased media that you’ve downloaded and copied to the drive. There’s no way of playing back that media within the iTunes app on your device, so you’ll have to stream it instead. Here’s a rundown of some recent MFi external storage devices. You’d expect a name like SanDisk to deliver the goods. The SanDisk iXpand V2 With USB 3.0 is one of the best examples of MFi pen drives on the market. As mentioned, the iXpand app is well-designed and has Share extension hooks plus good media playback capabilities. The drive’s curved design is pretty neat too. 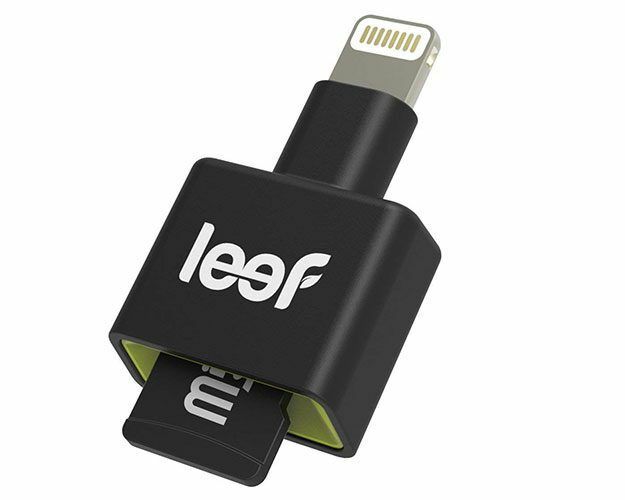 The Leef iBridge 3 With USB 3.1 takes a curved approach similar to the SanDisk iXpand, with the addition of a faster USB 3.1 Gen 1 connection. The Leef app includes a few useful features like fingerprint locking, a direct-to-drive camera, and automatic backups. It’s also available in some funky rainbow designs, if you’re interested. If a USB drive isn’t enough, the Mophie Spacestation is a 6000mAh battery and USB drive all in one. The Mophie Space app manages the external storage, but it hasn’t seen an update since 2016. The idea is a sound one though, and allows you to both charge and transfer data via Lightning—something most competitors can’t match. This is one of the best examples of the cheap and generic drives that are all over Amazon. 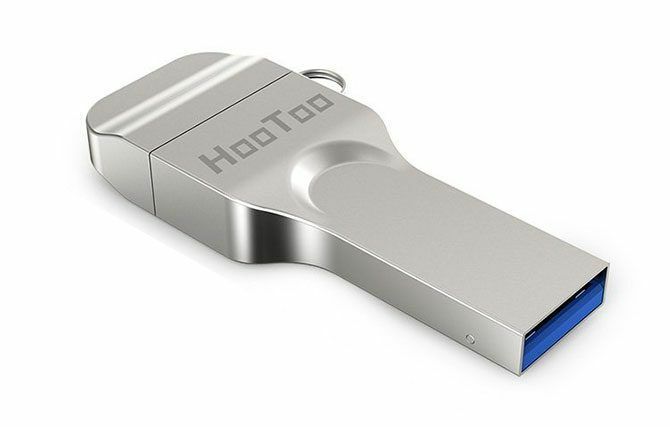 The HooToo 64GB Flash Drive With USB 3.0 uses the iPlugmate app that looks identical to the one used by many other cheap generic Lightning drives. Based on customer reviews, it works pretty well, but don’t expect miracles when it comes to media playback. Available in 16GB, 32GB, and 64GB storage sizes, the Verbatim iStore ‘n’ Go and the other drives in the series are basic yet functional. They use a generic USB stick design with the two connectors on either end. Of note is USB 3.0, which should speed up those large file transfers. The drive uses Verbatim’s Store ‘n’ Go app, which looks almost identical to the generic file transfer apps cheaper manufacturers use (like HooToo above). 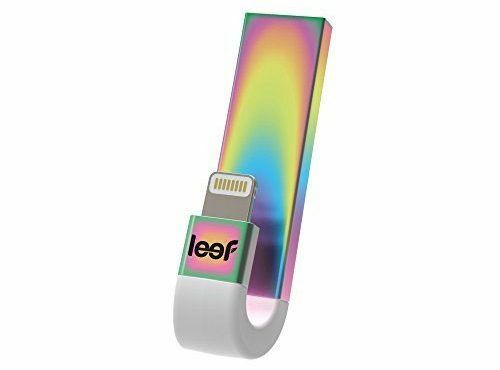 Here’s something a little different: the Leef iAccess MicroSD is a card reader that contains no internal storage but instead allows you to add your own microSD card. This means you can throw your old cards in there and make use of them right away, or transfer files from a digital camera memory card to your iPhone for sharing and safekeeping. These devices have potential use, but many of us don’t need them. For quick file transfers, AirDrop between iOS devices and macOS is usually sufficient. Windows users can still use iTunes file sharing (though a long-winded process) in a pinch. If you have a fast internet connection, the cloud is favorable. But if you can find a use for these drives, they’re a valid form of inexpensive intermediary storage. For video producers, particularly with smartphone stabilizers, being able to offload video is an absolute must. These drives let you do that, anywhere, without connecting your iPhone to a computer. Just don’t forget to pack a charger or a high-capacity backup external battery to keep the camera rolling.